The Director’s Office oversees all activities of the Division, including coordination of policy development, information dissemination and outreach. The Office sets and monitors progress towards various goals which assist the Division in achieving its mission. 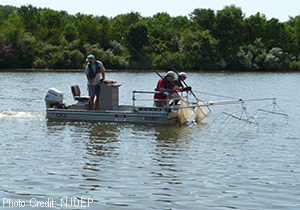 General monitoring and assessment-related activities and publications are managed by this Office, including, NJ's Long Term Water Monitoring and Assessment Strategy. Coordination with other external water monitoring programs is also a responsibility of the Director’s Office. 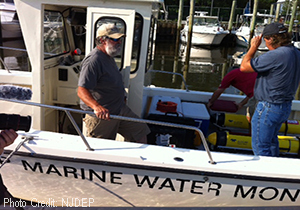 As such, the Office coordinates the activities of the New Jersey Water Monitoring Council. The Office also oversees implementation of NJ's Water Quality Data Exchange System and the Department's participation in the Barnegat Bay initiative. In addition, the Cooperative Coastal Monitoring Program (also known as the Beach Monitoring Program) & the Clean Shores program (removal of trash from coastal beaches) are also coordinated out of this Office. In addition to the monitoring networks above, the BFBM implements a new unified statewide approach in responding to Cyanobacterial Harmful Algal Blooms (HABs) in freshwater. 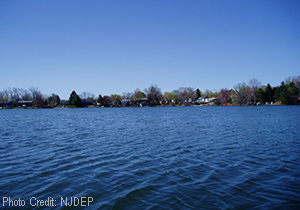 The HABs Strategy protects the public from risks associated with exposure to cyanobacteria and related toxins, and was developed jointly by NJDEP and the NJ Department of Health, with technical input from the NJ Department of Agriculture. The Bureau is involved in many aspects of the State's coastal water quality for both public and ecological health. Its roles include monitoring for compliance with the National Shellfish Sanitation Program, assisting with the Cooperative Coastal Monitoring Program, evaluation of the ecological health of the coastal waters, and monitoring to identify and track pollution sources impacting the State's coastal waters. BMWM operates three (3) state certified labs; Bacteriology, Chemistry and Microbiology. All three labs provide data which directly support BMWM and Department priorities. Uses of the monitoring data include: determination of shellfish growing water classifications; water quality assessments for the Integrated Report; identification of waters impaired for designated uses; development of water quality criteria; development of Total Maximum Daily Loads (TMDLs) and pollutant source tracking for New Jersey’s beach monitoring program. The Bureau develops water quality standards that provide the scientific foundation to assess, protect, and restore New Jersey’s water resources so that all of our rivers, lakes, and coastal waters are fishable, swimmable, and support healthy ecosystems, and so all of our freshwater resources are clean drinking water sources. This is accomplished through the assessment of data collected by BFBM and BMWM, the development of the total maximum daily loads, watershed restoration and protection plans, the Integrated Water Quality Assessment Report, and implemented through our community water monitoring and AmeriCorps NJ Watershed Ambassadors programs. BEARS also manages Water Quality Restoration Grants for Nonpoint Source Pollution which is funded in part by pass through Federal CWA 319(h) grants.